The European Space Agency and London’s Inmarsat company are moving to the next phase of their project to improve the efficiency of European airspace. The pair’s Iris programme would see air traffic controllers route planes via robust and secure satellite data links. At the moment, this management involves VHF radio voice messages – a system that will soon likely reach capacity. Additional technologies are therefore needed to cope with the expected growth in air traffic over the coming decades. Passenger demand is currently increasing by more than 5% a year globally with the European market among the busiest. Iris, which will now see a large-scale demonstration over the next 36 months, should help speed up the transmission of messages between controllers and cockpits; and ultimately aims to make full 4D trajectory management possible. “Flight paths are defined by latitude, longitude, altitude and time – and Iris, because of its performance, allows us to determine those waypoints to plus or minus 2-3 seconds,” explained Captain Mary McMillan, vice president of aviation safety and operational services at Inmarsat Aviation. 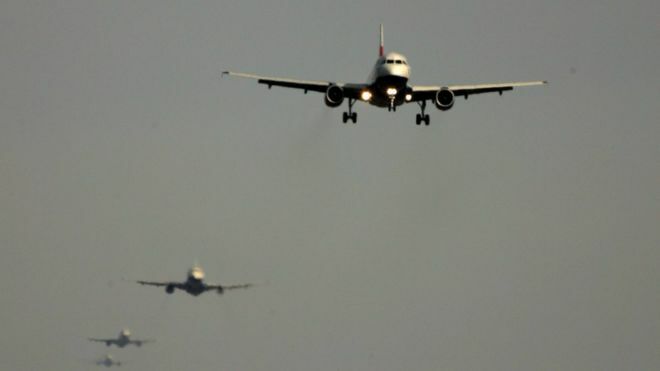 “With resilient and ubiquitous satellite downlink frequencies, controllers and aircraft will have the confidence to know that planes will be where they say they’re going to be at the prescribed time – and that will enable us to put more aircraft into the available airspace and do it safely,” she told BBC News. Iris has been in an R&D phase for a number of years, with demonstrations restricted to some small experimental flights. This next phase, funded through a €42m contract from Esa to Inmarsat, will see the technology prepared and proven on a larger number of aircraft fitted with the necessary communications equipment. The messages will be sent over Inmarsat’s L-band network of telecommunications spacecraft that sit high above the Earth. If all goes well, Iris would then be available for wide-scale adoption in the 2020s. Esa and Inmarsat have had to show that not only are satellite links robust and broad enough to carry the digital routing messages, but that the system as a whole can resist hacking. “It has to be safe, but it also has to be trusted and resilient for cyber security,” said Carlo Elia, the head of the telecommunications technologies, products and systems department at the space agency. Iris is a key element of the European Commission’s Single European Sky Air Traffic Management Research programme, also known as Sesar. This is developing a number of technologies to streamline the coordination of flights. At the moment, it is thought more than 40km is added to the average flight in Europe because routing is not optimised. If this can be improved there are obvious gains to be had for passengers in shorter flight times, and for airline operators in reduced fuel-use and emissions. Iris is one of a number of public-private partnerships that Esa now runs out of its telecoms HQ in Harwell, Oxfordshire. “The agency aims always to help improve the competitiveness of Europe’s satcom industry and to explore ways to enlarge markets. Iris is a typical case,” said Carlo Elia. “The other motivation for us of course is the clear societal and environmental benefits that come from such a project,” he told BBC News. As well as Inmarsat, more than 30 companies across Europe are working on Iris, including prime partners CGI UK and Thales Alenia Space, Italy. This entry was posted in BUSINESS, Europe, Science, Travel, World by rolyred. Bookmark the permalink.